After a lot of faffing about play did actually get under way at about 19.50, the match to be reduced to 14 overs a side because of the late start. You can see the full scorecard here. Glamorgan batted first, struggling right from the start despite some wayward bowling from Sussex. Having been 62 for 8 at one point they were probably relieved to get into three figures, though they only just managed this: they were all out for 101 in the last over. 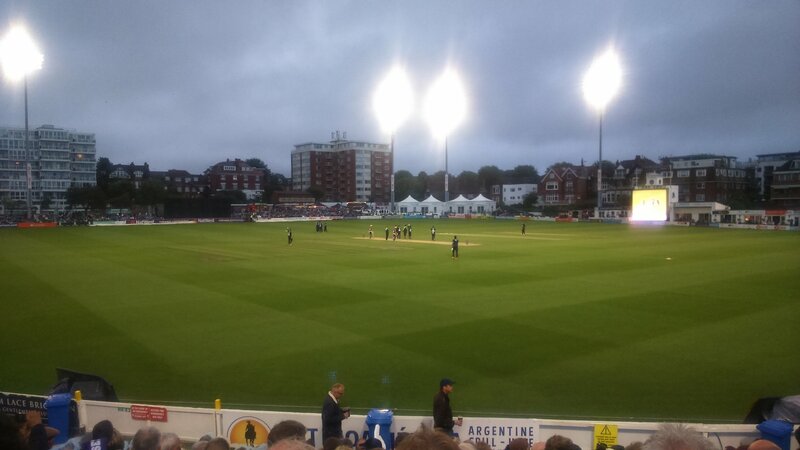 Sussex batted and got off to a much better start, but then the rain came back so they went off. They then came back again but only one ball was beowled before the rain (which was really just drizzle) started again so they went off again. And so on. In the end only four overs and one ball were possible before the rain came back for good and the match was abandoned with no result. The upshot of this was that Glamorgan qualified for the Quarter Finals and Sussex didn’t. Glamorgan were lucky. 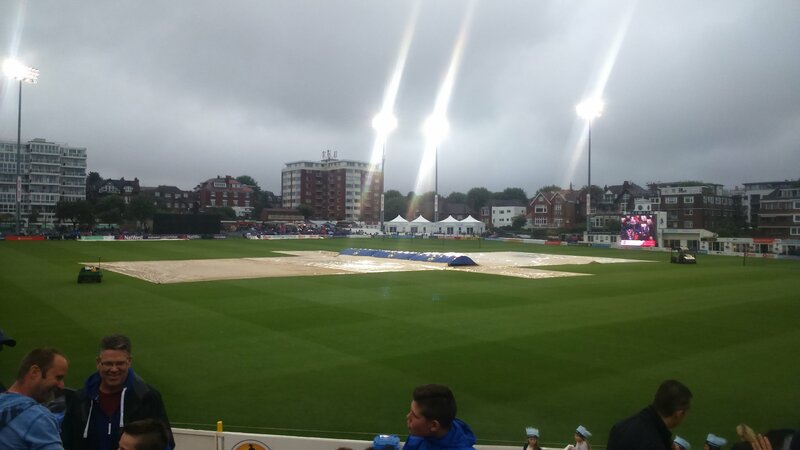 Sussex were 30-1 when play was halted but a minimum of five overs have to be bowled for a result to be declared. A few minutes more play and Sussex would almost certainly have won. Such is life. This entry was posted on July 29, 2016 at 11:10 am and is filed under Biographical, Cricket with tags cricket, Glamorgan, Natwest T20 Blast, Sussex. You can follow any responses to this entry through the RSS 2.0 feed. You can leave a response, or trackback from your own site. Only just seen this post. I was at that game too, at the opposite end of the ground to you it seems. Had thought of contacting you before but wasn’t sure if you went to any of the T20 stuff. Unfortunately Glamorgan’s batting then was rather like tonight’s, which I watched on TV. They’ve also had a 95 all out and a 130 all out over the last fortnight, so batting collapses are the norm these days.